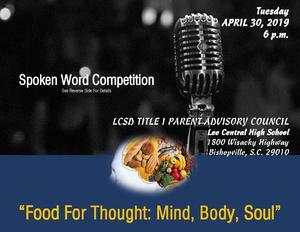 Lee County School District’s (LCSD) Parent Advisory Council (PAC) will host its first ever Spoken Word Competition. The event is scheduled for Tuesday, April 30 at 6 p.m. and will be held at Lee Central High School (LCHS) at 1800 Wisacky Highway in Bishopville, S.C. The theme, “Food for Thought: Mind, Body, Soul” is intended to provoke reflection on how a holistic approach at education or nearly anything in life yields positive outcomes. The PAC is a function of Title I and consists of a network of parents, educators and community leaders whose sole purpose is to undergird parental education efforts, often in the most unconventional ways. The competition is one of those ways. The entire community is encouraged to participate, fulfilling a pledge of Title I – to engage parents/families, communities and schools to work together for the education and equipping of students to become productive citizens. So far, students from elementary to high school, parents and key figures in the community are on tap to compete in the Coffee House/Café-like experience. LCHS’s cafeteria will be transformed into a hip, new, spot for poets, neo-soul artists, rap enthusiasts and various orators to share their thoughts. 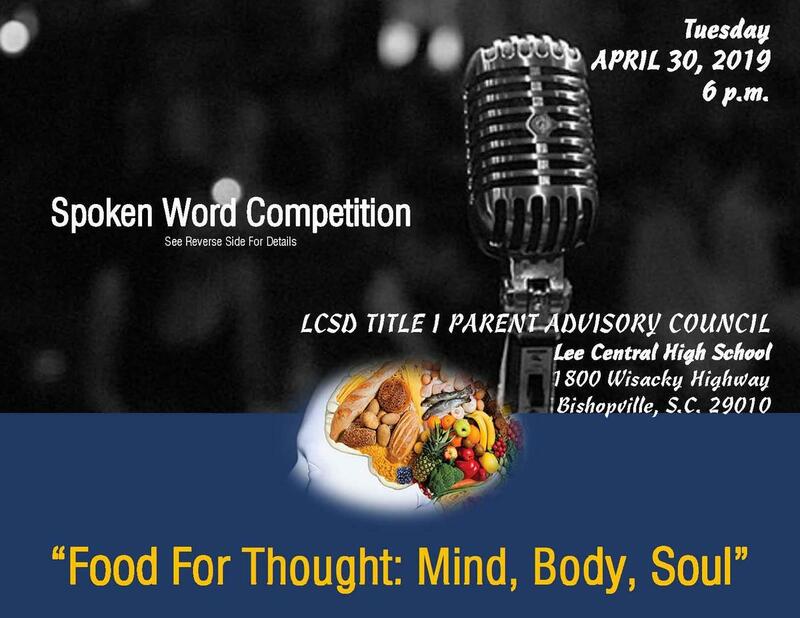 As a special treat, opening remarks in the form of the spoken word will be presented by LCSD Superintendent Dr. Wanda Andrews. The work must be original, positive and tie into the theme. Memorization is encouraged but not necessary. Participants may read only one piece of their work of three minutes or less in time. Profanity or other inappropriate material is not permitted. First place prize is a $75 gift card; second place is a $50 gift card; and third place prize is a $25 gift card. Consolation prizes will also be given away. Work will be judged on creativity, expression, understanding and stage presence. Participants are encouraged to also just have fun. Forward your recitation/reading to croslanda@lee.k12.sc.us by April 30, 2019 for approval.